(...) The house that was hit by the rocket is located 100 km from the Gaza Strip, and the ‘Iron Dome’ system that the Israeli government has in place to intercept rockets fired from Gaza was not activated. No Palestinian armed resistance group claimed credit for the attack. When a rocket was fired from Gaza nearly two weeks ago, the Israeli airforce responded by dropping one hundred bombs in different parts of the Gaza Strip. Residents of Gaza report that they are fearful of what Israeli forces may be preparing to do, noting that drones and helicopters have been hovering over parts of Gaza all night. Israeli Prime Minister Binyamin Netanyahu reportedly cut short his trip visiting Trump in Washington DC to return to Israel to “manage our operations up close”. Pas très efficace leur « dôme d’acier » !!! WASHINGTON - U.S. President Donald Trump met Prime Minister Benjamin Netanyahu Monday to sign a presidential proclamation officially recognizing the Golan Heights as Israeli territory on Monday, thus formalizing a move announced with a tweet earlier on Thursday. The Israeli Air Force carried out, on Monday at night, a series of air strikes targeting several areas, including homes, in many parts of the besieged Gaza Strip, wounding eight Palestinians, including two children. Media sources said the army fired two missiles into a commercial building, in the center of Gaza city, wounding two Palestinians, and causing excessive damage to the property and surrounding homes. The army also fired a missile at a residential building in the Rimal neighborhood, in Gaza city, wounding two children, and causing excessive damage to the building and some surrounding homes. At least one Palestinian was also injured when the army fired missiles into a building, east of the Sheja’eyya neighborhood, east of Gaza city. The army also fired two missiles into two sites, west of Gaza city, and in Beit Lahia, in the northern part of the Gaza Strip, causing damage, in addition to several missiles striking Palestinian lands east of Khan Younis and Rafah, in the southern parts of the coastal region. The Maan News Agency has reported that the army fired more than 100 missiles into various areas in the Gaza Strip. It added that all schools, universities, banks and various institutions have decided to close their doors, to avoid civilian casualties should the situation witness a further deterioration. Among the targeted buildings are offices of Ismael Haniyya, the political leader of Hamas movement. 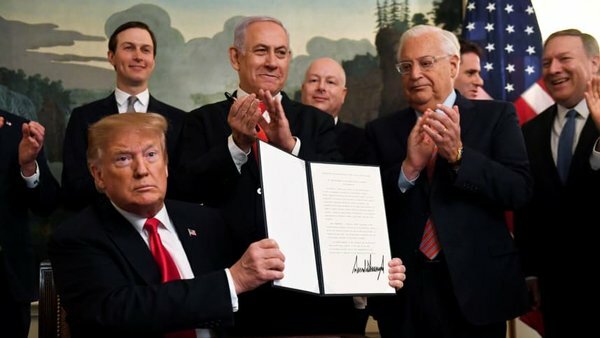 U.S. President Donald Trump’s statement that “it is time for the United States to fully recognize Israel’s sovereignty over the Golan Heights” received an enthusiastic welcome in Israel. Prime Minister Benjamin Netanyahu, who got a shot in the arm from Trump at a low point in his election campaign, welcomed this “Purim miracle.” His rival Benny Gantz, whose party’s leading lights helped push for American recognition of the Golan’s annexation, said in a statement that Trump was cementing his place in history as a true friend of Israel. That Netanyahu and Gantz were both delighted is no surprise; the annexation of the Golan and the settlements established there enjoy widespread support in Israel. Since the Yom Kippur War of 1973, Syria has refrained from any attempt to recover the Golan by force, preferring to maintain the quiet and conduct peace talks that achieved nothing. The Druze residents of the northern Golan have also accepted Israeli rule without rebelling. The settlements on the Golan were established by the Labor Party, rather than the messianic Gush Emunim movement that settled the West Bank, and the Israelis who live there are termed “residents” rather than “settlers.” The beautiful vistas, the empty spaces and the snow on Mount Hermon are especially beloved by Israeli tourists. 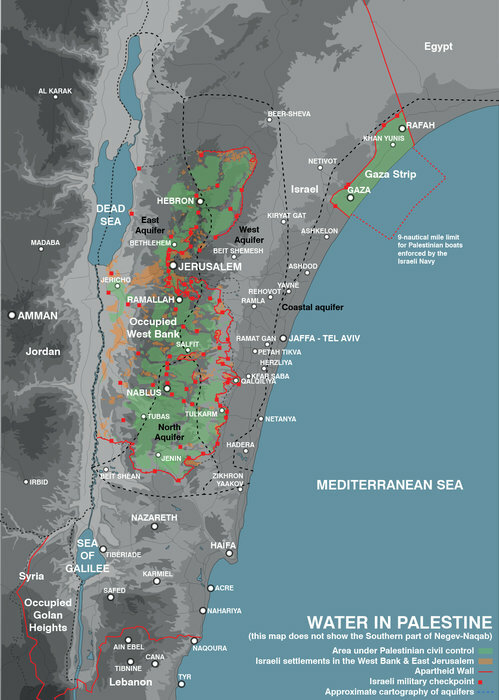 Nevertheless, despite the quiet and the internal consensus that sees the Golan as an inseparable part of Israel, this is occupied territory that Israel retains in violation of both international law and the principle at the basis of United Nations Security Council Resolution 242 — that the acquisition of territory by war is unacceptable. Israel accepted this principle, and six prime ministers, including Netanyahu, have held talks with the Syrians on returning the Golan in exchange for peace. The most recent talks were cut short by the outbreak of Syria’s civil war eight years ago, and the implosion on the other side of the border spurred appetites here for perpetuating the occupation with U.S. backing. During President Barack Obama’s tenure, that idea seemed hopeless. But Trump, no great fan of international laws and agreements, acceded happily to the Israeli request. Trump’s announcement and the applause that greeted it in Jerusalem send the troubling message that Israel is no longer interested in a peace agreement. It’s true that Syria, having fallen apart, is now weak and will settle for diplomatic censure, and in any case the chance of resuming negotiations in the north is near zero. But Trump gave Syria and its allies a renewed pretext for possible military action. In the near term, the U.S. green light to annexing the Golan will deepen the Israeli delusion that U.S. approval is sufficient to revise the world map and contribute to erasing the 1967 lines as the relevant reference points for solving the Israeli-Arab conflict. The U.S. recognition will inevitably increase pressure from the right to annex Area C of the West Bank (which is under full Israeli control), intensifying the occupation and the bloody conflict with the Palestinians. Since no one is any longer even trying to pretend that Donald Trump isn’t intervening in Israel’s elections on Prime Minister Benjamin Netanyahu’s behalf, the only question left to ask following the U.S. president’s announcement on Twitter that “it is time for the United States to fully recognize Israel’s sovereignty over the Golan Heights,” is on the timing. You don’t need to be a conspiracy theorist to speculate, that given the extremely intimate level of coordination between Trump and Netanyahu’s teams, the timing is no coincidence. For a possible reason why Trump didn’t wait for Netanyahu to arrive in Washington before lobbing his diplomatic bombshell, check out Netanyahu’s pale and worried features at the press conference on Wednesday where he stated that Iran has obtained embarrassing material from Benny Gantz’s phone. Netanyahu is petrified that the new revelations on his trading in shares in his cousin’s company, which netted him $4.3 million and may have a connection with the company’s dealings with the German shipyard from which Israel purchases it submarines, could dominate the last stage of the election campaign. That’s why he so blatantly abused his position as the minister in charge of Israel’s intelligence services, to claim he knew what Iran had on Gantz. He desperately needs to grab back the news agenda. But the Gantz phone-hacking story, which leaked to the media last Thursday evening, has proven a damp squib. 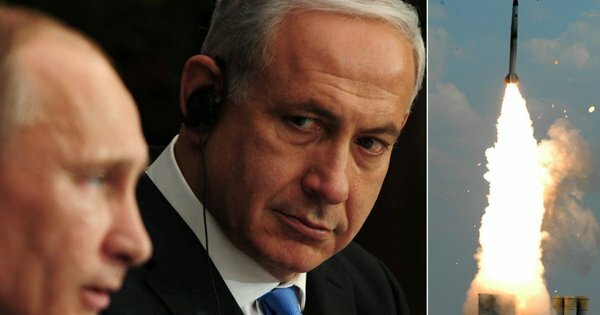 There is no credible evidence, except for the word of a panicking prime minister, that whoever hacked his phone, even assuming it was the Iranians, have anything to blackmail Gantz with. So the next best thing is to get a friend with 59 million followers on Twitter to create a distraction. Conveniently, this happened just before the agenda-setting primetime news shows on Israeli television. And how useful that Secretary of State Mike Pompeo is currently in Israel anyway and has just visited the Western Wall, accompanied by Netanyahu – another diplomatic first as previously senior U.S. officials, including Trump during his visit in 2017, refrained from doing so together with Israeli politicians, to avoid the impression that they were prejudging the final status of eastern Jerusalem. A recognition of Israeli sovereignty on the Golan is also the perfect political gesture as far as Netanyahu is concerned. The Golan isn’t the West Bank, and certainly not Gaza. There is near-complete consensus among Israelis today that under no circumstances should Israel relinquish its control over the strategic Heights. Certainly not following eight years of war within Syria, during which Iran and Hezbollah have entrenched their presence on Israel’s northern border. Netanyahu’s political rivals have absolutely no choice but to praise Trump for helping the Likud campaign, anything else would be unpatriotic. They can’t even point out the basic fact that Trump’s gesture is empty. Just as his recognition of Jerusalem as Israel’s capital was. It won’t change the status of the Golan in international law and with the exception of a few client-states in Latin America, no other country is going to follow suit. It could actually cause Israel diplomatic damage by focusing international attention on the Golan, when there was absolutely no pressure on Israel to end its 51-year presence there anyway. Trump’s tweet does no obligate the next president and a reversal by a future U.S. administration would do more damage to Israel than the good that would come from Trump’s recognition. In 2019, the U.S. is treating Israel as a vassal state and a banana republic by flagrantly interfering in its election. This time the Israeli prime minister won’t be complaining. Le gouvernement syrien a condamné vendredi les propos du président américain Donald Trump, lequel a déclaré que l’heure était venue pour les Etats-Unis de reconnaître la souveraineté d’Israël sur le plateau du Golan. BEYROUTH (Reuters) - Le gouvernement syrien a condamné vendredi les propos du président américain Donald Trump, lequel a déclaré que l’heure était venue pour les Etats-Unis de reconnaître la souveraineté d’Israël sur le plateau du Golan. Dans un communiqué publié par l’agence de presse officielle Sana, une source au ministère syrien des Affaires étrangères estime que la déclaration de Trump illustre le « soutien aveugle des Etats-Unis » à Israël et ajoute que Damas est déterminé à récupérer le plateau du Golan par « tous les moyens possibles ». Les déclarations de Donald Trump ne changent rien à « la réalité que le Golan est et restera syrien », ajoute cette source, estimant qu’elles reflètent une violation flagrante de résolutions du Conseil de sécurité de l’Onu. A Moscou, également, la porte-parole du ministère russe des Affaires étrangères, citée par l’agence de presse RIA, a déclaré que tout changement de statut du Golan représenterait une violation flagrante des décisions des Nations unies sur cette question. Q - Sur le Golan, le président américain Donald Trump vient d’annoncer que le temps est venu de reconnaître la souveraineté israélienne sur les Hauteurs du Golan, « qui est d’une importance stratégique et sécuritaire décisive pour l’Etat d’Israël et pour la stabilité régionale ». Cette analyse a-t-elle un sens, et une telle reconnaissance, venant après la négation américaine d’une paix négociée concernant le statut de Jérusalem, va-t-elle déclencher une réaction diplomatique française au nom de la seule France, de la France à l’UE, et de la France à l’ONU ? R - Le Golan est un territoire occupé par Israël depuis 1967. La France ne reconnaît pas l’annexion israélienne de 1981. Cette situation a été reconnue comme nulle et non avenue par plusieurs résolutions du Conseil de sécurité, en particulier la résolution 497 du Conseil de sécurité des Nations Unies. 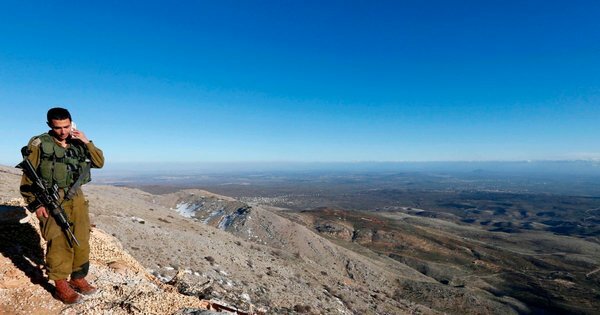 La reconnaissance de la souveraineté israélienne sur le Golan, territoire occupé, serait contraire au droit international, en particulier l’obligation pour les Etats de ne pas reconnaître une situation illégale. NEW YORK (Ma’an) — The United Nations General Assembly (UNGA) voted in favor of five resolutions regarding Palestine and a sixth resolution on the Golan Heights, on Friday evening. One of the most important resolutions adopted called upon member states not to recognize any measures taken by Israel in Jerusalem and to maintain the current status-quo in the holy city. UNGA also adopted a sixth resolution on the occupied Syrian Golan, demanding the withdrawal of Israel from all of the territory and affirming Syria’s sovereignty over it, in line with the relevant resolutions of the UN Security Council. On November 17, the UNGA voted in favor of eight resolutions on Palestine and a ninth on the Syrian Golan Heights. One reason for Israel’s exceptional caution in dealing with Hamas in the Gaza Strip is its growing concern over the northern front. Though it may sound like a threadbare excuse, this seems to be one of the considerations driving Prime Minister Benjamin Netanyahu to decide, time after time, to try to reach a cease-fire in Gaza. The problem Israel faces in the north, in a nutshell, is the real danger that its operational window of opportunity is closing. In recent years, Israel has exploited the upheaval in the Arab world to expand its offensive activity, most of which is secret. Via hundreds of airstrikes and special operations, the army and the intelligence agencies have worked to distance the danger of another war and reduce the enemy’s operational capabilities in the event that war does break out. In Syria and Lebanon, the campaign initially focused on preventing Iran from smuggling advanced weaponry to Hezbollah. But over the last year or so, a new mission has been added – preventing Iran’s military entrenchment in Syria. This peaked with a flurry of incidents between the Israel Defense Forces and Iran’s Revolutionary Guards last winter and spring. A problem may also be developing in Lebanon. In his address to the United Nations General Assembly in September, Netanyahu warned of efforts by Iran and Hezbollah to set up missile production facilities in the Beirut area. Given the problems its smuggling operations had encountered, the Revolutionary Guards’ Quds force apparently decided it had to shorten the distance between the manufacturer and the customer by moving its efforts to improve the accuracy of Hezbollah’s rockets to Lebanon. Netanyahu’s speech did its job. In the three days between that speech and the tour of Beirut the Lebanese government conducted for diplomats to rebut it, someone worked hard to get rid of the evidence. But over the long run, Iran seems unlikely to abandon this effort. What’s even more worrying is that Putin has recently displayed increased interest in events in Lebanon. In the worst-case scenario, the defensive umbrella — both real and symbolic — that Russia has spread over northwest Syria would be expanded to Lebanon, further complicating Israel’s calculus. Even now, at least according to Arab media reports, Israel hasn’t conducted an airstrike in Lebanon since February 2014, when the IAF, apparently pursuing an arms convoy that had crossed the border from Syria, bombed a target in Janta, a few hundred meters to the Lebanese side of the Lebanon-Syria border. Hezbollah, which was willing to pretend the spit was rain as long as its convoys were being bombed on the Syrian side, immediately responded with a series of attacks by Druze residents of the Syrian Golan Heights. The cell’s commander, Lebanese terrorist Samir Kuntar, and his successor, Hezbollah’s Jihad Mughniyeh, were both subsequently killed in attacks attributed to Israel. Since then, Israel has confined its attacks to Syria. But playing chess with Hezbollah is one thing. Trying to figure out what Putin wants, in Syria and perhaps also in Lebanon, even as Hezbollah is trying to manufacture weapons there, is a challenge of a completely different order of magnitude. Netanyahu was presumably hinting at this problem, among others, when he spoke about security considerations that he can’t share with the public, at the memorial for Paula Ben-Gurion earlier this week. Israel secretly armed and funded at least 12 rebel groups in southern Syria that helped prevent Iran-backed fighters and militants of the Islamic State from taking up positions near the Israeli border in recent years, according to more than two dozen commanders and rank-and-file members of these groups. The military transfers, which ended in July of this year, included assault rifles, machine guns, mortar launchers and transport vehicles. Israeli security agencies delivered the weapons through three gates connecting the Israeli-occupied Golan Heights to Syria—the same crossings Israel used to deliver humanitarian aid to residents of southern Syria suffering from years of civil war. When the war against Syria began in 2011, the Zionist enemy was still occupying the Golan Heights and the Turkish enemy was still occupying the Sanjak of Alexandretta. Over the years, the Syrian Arab Army has managed to dismantle the conspiracies led by the United States and other colonial powers, in which the Zionist enemy and the Turkish enemy participated. According to the new balance of powers in the region, when the war in Syria comes to an end, the Zionist enemy will be forced to withdraw fully from the Golan without alleged peace deals that follow the Camp David, Oslo and Arabah models. The withdrawal will be without conditions and similar to the Zionist withdrawal from southern Lebanon in 2000. The Zionist enemy has a crippling fear about entering into a direct war with the Syrian Arab Army, whose military and fighting capabilities have developed greatly and has stunned the Zionist enemy. The enemy has tried and failed more than once to test the Syrian air defenses. Syria is fully prepared to enter into a war and liberate the occupied Arab territory in the Golan. Of course, the same new equations apply to the Turkish enemy, which will be forced to withdraw from Syrian territory which it occupies, because the Syrian Arab Army and its allies will not accept anything but the full liberation of Syrian Arab territory, which has been occupied by aggressor nations which are either directly engaged in this war or which have been occupied by terrorist takfiri groups who work as proxies for them. After that, Turkey will have to withdraw from the Sanjak of Alexandretta which has been historically occupied and which the Syrian state will not allow to remain occupied. The Syrian Arab Army is ready to enter into a war to liberate it — with God as our witness. Such a decision by the United States would only add to the ongoing instability in the Middle East. After the transfer of the U.S. embassy to Jerusalem, it would confirm that the United States is no longer even a “dishonest broker” in Arab-Israel peace negotiations, but rather has become a direct party in the Arab-Israeli conflict. This will make it even more difficult for Washington to broker “the deal of the century” between Israelis and Palestinians. Talks are in limbo, despite many statements this past year on the imminence of a peace plan. This situation will strengthen the hand of Russia, which is now seen as an important actor maintaining working relations with all regional leaders, from Syrian President Bashar al-Assad to Israeli Prime Minister Benjamin Netanyahu to Saudi Crown Prince Mohammed bin Salman. It will also play into the hands of Iran, allowing Tehran to widen its alliance with certain “Sunni groups.” We can even imagine that it may play into Assad’s hands as well. After the 2006 war in Lebanon, some Syrian Muslim Brotherhood leaders were ready to engage with Assad in the name of the struggle against Israel. Today, U.S. recognition of Israel’s annexation of the Golan Heights may revive such impulses. Sunnis have been pushed out by the war. The new Syria is smaller, in ruins and more sectarian. Homs, like all of the cities recaptured by the government, now belongs mostly to Syria’s victorious minorities: Christians, Shias and Alawites (an esoteric offshoot of Shia Islam from which Mr Assad hails). These groups banded together against the rebels, who are nearly all Sunni, and chased them out of the cities. Sunni civilians, once a large majority, followed. More than half of the country’s population of 22m has been displaced—6.5m inside Syria and over 6m abroad. Most are Sunnis. 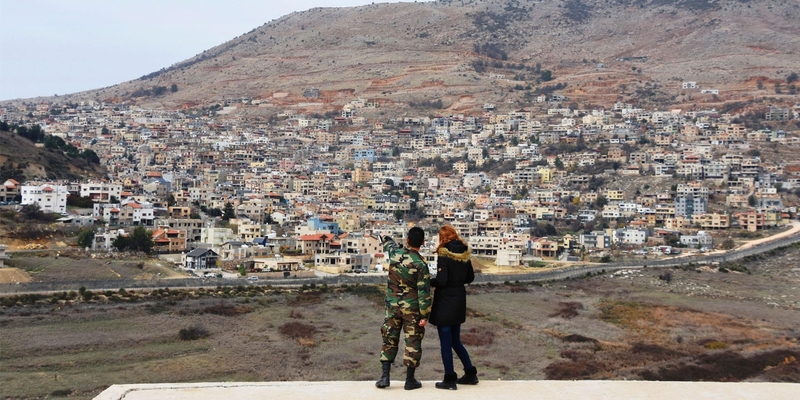 Even in areas less touched by the war, Syria is changing. The old city of Damascus, Syria’s capital, is an architectural testament to Sunni Islam. But the Iranian-backed Shia militias that fight for Mr Assad have expanded the city’s Shia quarter into Sunni and Jewish areas. Portraits of Hassan Nasrallah, the leader of Hizbullah, a Lebanese Shia militia, hang from Sunni mosques. Advertisements for Shia pilgrimages line the walls. In the capital’s new cafés revellers barely notice the jets overhead, bombing rebel-held suburbs. “I love those sounds,” says a Christian woman who works for the UN. Like other regime loyalists, she wants to see the “terrorists” punished. Mr Assad’s men captured the last rebel strongholds around Damascus in May. He now controls Syria’s spine, from Aleppo in the north to Damascus in the south—what French colonisers once called la Syrie utile (useful Syria). The rebels are confined to pockets along the southern and northern borders (see map). Lately the government has attacked them in the south-western province of Deraa. The regime is in a celebratory mood. Though thinly spread, it has survived the war largely intact. Government departments are functioning. In areas that remained under Mr Assad’s control, electricity and water supplies are more reliable than in much of the Middle East. Officials predict that next year’s natural-gas production will surpass pre-war levels. The National Museum in Damascus, which locked up its prized antiquities for protection, is preparing to reopen to the public. The railway from Damascus to Aleppo might resume operations this summer. To mark national day on April 17th, the ancient citadel of Aleppo hosted a festival for the first time since the war began. Martial bands, dancing girls, children’s choirs and a Swiss opera singer (of Syrian origin) crowded onto the stage. “God, Syria and Bashar alone,” roared the flag-waving crowd, as video screens showed the battle to retake the city. Below the citadel, the ruins stretch to the horizon. Mr Assad (pictured) has been winning the war by garrisoning city centres, then shooting outward into rebel-held suburbs. On the highway from Damascus to Aleppo, towns and villages lie desolate. A new stratum of dead cities has joined the ones from Roman times. The regime has neither the money nor the manpower to rebuild. Before the war Syria’s economic growth approached double digits and annual GDP was $60bn. Now the economy is shrinking; GDP was $12bn last year. Estimates of the cost of reconstruction run to $250bn. Syrians are experienced construction workers. When Lebanon’s civil war ended in 1990, they helped rebuild Beirut. But no such workforce is available today. In Damascus University’s civil-engineering department, two-thirds of the lecturers have fled. “The best were first to go,” says one who stayed behind. Students followed them. Those that remain have taken to speaking Araglish, a hotch-potch of Arabic and English, as many plan futures abroad. Traffic flows lightly along once-jammed roads in Aleppo, despite the checkpoints. Its pre-war population of 3.2m has shrunk to under 2m. Other cities have also emptied out. Men left first, many fleeing the draft and their likely dispatch to the front. As in Europe after the first world war, Syria’s workforce is now dominated by women. They account for over three-quarters of the staff in the religious-affairs ministry, a hitherto male preserve, says the minister. There are female plumbers, taxi-drivers and bartenders. Millions of Syrians who stayed behind have been maimed or traumatised. Almost everyone your correspondent spoke to had buried a close relative. Psychologists warn of societal breakdown. As the war separates families, divorce rates soar. More children are begging in the streets. When the jihadists retreat, liquor stores are the first to reopen. Mr Assad, though, seems focused less on recovery than rewarding loyalists with property left behind by Sunnis. He has distributed thousands of empty homes to Shia militiamen. “Terrorists should forfeit their assets,” says a Christian businesswoman, who was given a plush café that belonged to the family of a Sunni defector. A new decree, called Law 10, legitimises the government’s seizure of such assets. Title-holders will forfeit their property if they fail to re-register it, a tough task for the millions who have fled the country. The measure has yet to be implemented, but refugees compare it to Israel’s absentees’ property laws, which allow the government to take the property of Palestinian refugees. Syrian officials, of course, bridle at such comparisons. The ruling Baath party claims to represent all of Syria’s religions and sects. The country has been led by Alawites since 1966, but Sunnis held senior positions in government, the armed forces and business. Even today many Sunnis prefer Mr Assad’s secular rule to that of Islamist rebels. But since pro-democracy protests erupted in March 2011, Syrians detect a more sectarian approach to policymaking. The first demonstrations attracted hundreds of thousands of people of different faiths. So the regime stoked sectarian tensions to divide the opposition. Sunnis, it warned, really wanted winner-take-all majoritarianism. Jihadists were released from prison in order to taint the uprising. As the government turned violent, so did the protesters. Sunni states, such as Turkey, Saudi Arabia and Qatar, provided them with arms, cash and preachers. Hardliners pushed aside moderates. By the end of 2011, the protests had degenerated into a sectarian civil war. The country’s chief mufti is a Sunni, but there are fewer Sunnis serving in top posts since the revolution. Last summer Mr Assad replaced the Sunni speaker of parliament with a Christian. In January he broke with tradition by appointing an Alawite, instead of a Sunni, as defence minister. Officially the government welcomes the return of displaced Syrians, regardless of their religion or sect. “Those whose hands are not stained with blood will be forgiven,” says a Sunni minister. Around 21,000 families have returned to Homs in the last two years, according to its governor, Talal al-Barazi. But across the country, the number of displaced Syrians is rising. Already this year 920,000 people have left their homes, says the UN. Another 45,000 have fled the recent fighting in Deraa. Millions more may follow if the regime tries to retake other rebel enclaves. When the regime took Ghouta, in eastern Damascus, earlier this year its 400,000 residents were given a choice between leaving for rebel-held areas in the north or accepting a government offer of shelter. The latter was a euphemism for internment. Tens of thousands remain “captured” in camps, says the UN. “We swapped a large prison for a smaller one,” says Hamdan, who lives with his family in a camp in Adra, on the edge of Ghouta. They sleep under a tarpaulin in a schoolyard with two other families. Armed guards stand at the gates, penning more than 5,000 people inside. The head of the camp, a Christian officer, says inmates can leave once their security clearance is processed, but he does not know how long that will take. Returning home requires a second vetting. Trapped and powerless, Hamdan worries that the regime or its supporters will steal his harvest—and then his land. Refugees fear that they will be locked out of their homeland altogether. “We’re the new Palestinians,” says Taher Qabar, one of 350,000 Syrians camped in Lebanon’s Bekaa Valley. Some argue that Mr Assad, with fewer Sunnis to fear, may relax his repressive rule. Ministers in Damascus insist that change is inevitable. They point to a change in the constitution made in 2012 that nominally allows for multiparty politics. There are a few hopeful signs. Local associations, once banned, offer vocational training to the displaced. State media remain Orwellian, but the internet is unrestricted and social-media apps allow for unfettered communication. Students in cafés openly criticise the regime. Why doesn’t Mr Assad send his son, Hafez, to the front, sneers a student who has failed his university exams to prolong his studies and avoid conscription. A decade ago Mr Assad toyed with infitah (liberalisation), only for Sunni extremists to build huge mosques from which to spout their hate-speech, say his advisers. He is loth to repeat the mistake. Portraits of the president, appearing to listen keenly with a slightly oversized ear, now line Syria’s roads and hang in most offices and shops. Checkpoints, introduced as a counter-insurgency measure, control movement as never before. Men under the age of 42 are told to hand over cash or be sent to the front. So rife are the levies that diplomats speak of a “checkpoint economy”. Having resisted pressure to compromise when he was losing, Mr Assad sees no reason to make concessions now. He has torpedoed proposals for a political process, promoted by UN mediators and his Russian allies, that would include the Sunni opposition. At talks in Sochi in January he diluted plans for a constitutional committee, insisting that it be only consultative and based in Damascus. His advisers use the buzzwords of “reconciliation” and “amnesty” as euphemisms for surrender and security checks. He has yet to outline a plan for reconstruction. Mr Assad appears to be growing tired of his allies. Iran has resisted Russia’s call for foreign forces to leave Syria. It refuses to relinquish command of 80,000 foreign Shia militiamen. Skirmishes between the militias and Syrian troops have resulted in scores of deaths, according to researchers at King’s College in London. Having defeated Sunni Islamists, army officers say they have no wish to succumb to Shia ones. Alawites, in particular, flinch at Shia evangelising. “We don’t pray, don’t fast [during Ramadan] and drink alcohol,” says one. But Mr Assad still needs his backers. Though he rules most of the population, about 40% of Syria’s territory lies beyond his control. Foreign powers dominate the border areas, blocking trade corridors and the regime’s access to oilfields. In the north-west, Turkish forces provide some protection for Hayat Tahrir al-Sham, a group linked to al-Qaeda, and other Sunni rebels. American and French officers oversee a Kurdish-led force east of the Euphrates river. Sunni rebels abutting the Golan Heights offer Israel and Jordan a buffer. In theory the territory is classified as a “de-escalation zone”. But violence in the zone is escalating again. New offensives by the regime risk pulling foreign powers deeper into the conflict. Turkey, Israel and America have drawn red lines around the rebels under their protection. Continuing Iranian operations in Syria “would be the end of [Mr Assad], his regime”, said Yuval Steinitz, a minister in Israel, which has bombed Iranian bases in the country. Israel may be giving the regime a green light in Deraa, in order to keep the Iranians out of the area. There could be worse options than war for Mr Assad. More fighting would create fresh opportunities to reward loyalists and tilt Syria’s demography to his liking. Neighbours, such as Jordan and Lebanon, and European countries might indulge the dictator rather than face a fresh wave of refugees. Above all, war delays the day Mr Assad has to face the question of how he plans to rebuild the country that he has so wantonly destroyed. Beirut, Lebanon: Thousands of Syrian residents of the Israeli-occupied Golan Heights are expected to boycott the first municipal elections imposed by Israel on the area, rejecting what they call the ’Israelization’ of the territory. Russian Foreign Minister Sergei Lavrov said on Monday that only Syrian government troops should have a presence on the country’s southern border which is close to Jordan and Israel, the RIA news agency reported. Lavrov was cited as making the comments at a joint news conference in Moscow with Jose Condungua Pacheco, his counterpart from Mozambique. Meanwhile, Defense Minister Avigdor Lieberman will leave on Wednesday for a short visit to Russia. He is scheduled to meet with his counterpart, Russia’s Defense Minister Sergei Shvigo, the ministry said in a statement on Monday. Lieberman is expected to discuss with his hosts the recent events in the Middle East, primarily the tension between Israel and Iran over the Iranian military presence in Syria. The United States warned Syria on Friday it would take “firm and appropriate measures” in response to ceasefire violations, saying it was concerned about reports of an impending military operation in a de-escalation zone in the country’s southwest. To observe that water is a luxury inaccessible to many has become a cliché of the humanitarian discourse. What this narrative tends to leave asides are the political systems determining the unequal conditions in access to water, whether it is capitalism and its privatizations, or colonialism and its ethnic segregation of this access. Similarly, the so-called “international community” can, at times, recognize the illegally of the Israeli settlements in the West Bank and East Jerusalem (cf. Resolution 2234 voted by the UN Security Council in December 2016) but does not seem to consider the totality of the territorial, social, administrative, judiciary, policing, and resource-management apparatuses that constitute the Israeli apartheid in Palestine – the term “Palestine” designates here the historical region that now includes Israel, the Gaza Strip, Jerusalem, and the West Bank. – All Israeli citizens – this includes the 1.8 million of Palestinians – have a total access to the coasts of these three seas, to the exception of the coast along the Gaza Strip since the 2005 Israeli disengagement. They even have full access to the East coast of the Sea of Galilee since the invasion and subsequent occupation of the Syrian Golan Heights in 1967. Israël est forcément obligé de riposter. The incident came after weeks of rising tensions and followed US President Donald Trump’s decision to withdraw from a key 2015 Iran nuclear deal on Tuesday, a move Israel had long advocated. It led to immediate calls for restraint from Russia, France and Germany. “The escalation of the last hours shows us that it’s really about war and peace,” warned German Chancellor Angela Merkel. The raids that a monitor said killed 23 fighters were one of the largest Israeli military operations in recent years and the biggest such assault on Iranian targets, the military said. “We hit nearly all the Iranian infrastructure in Syria,” Defence Minister Avigdor Lieberman told a security conference. Israel carried out the raids after it said 20 rockets, either Fajr or Grad type, were fired from Syria at its forces in the occupied Golan Heights at around midnight. It blamed the rocket fire on Iran’s Al-Quds force, adding that Israel’s anti-missile system intercepted four while the rest did not land in its territory. Though Israel has hit Iranian forces in Syria with a number of deadly airstrikes, Tehran has been restrained in hitting back, until now. The rocket attack against Israel appeared to be in response to Israeli strikes on southern Syria on Wednesday. The barrage came after an apparent Israeli missile strike against a village in the Syrian Golan Heights late Wednesday. Autre version des faits de cette nuit. Russian President Vladimir Putin thought he could succeed where the U.S.’s then-President Barack Obama failed. Pacify Syria, rescue the regime of his client, President Bashar Assad, and balance the conflicting interests of Iran and Israel in the war-torn country. All this he did with a relatively small investment: the deployment of a couple of dozen aircraft and 2,000 men. As foreign campaigns go, it was power projection on the cheap. The United States on a similar mission would have used a force 10 times the size – aircraft carrier groups and hundreds of fighter jets, aerial tankers and electronic warfare planes. Not to mention boots on the ground. But Russia could pull it off thanks to the cannon fodder supplied by Iran. Tens of thousands of Shi’ite mercenaries, mainly refugees from Afghanistan, propped up Assad’s failing battalions. Hezbollah fighters came from Lebanon to carry out the more difficult operations. Russia made do with small teams of special-force troops and, where more muscle was needed, its own mercenaries. It was a relatively small investment with few casualties and not, as some predicted two years ago, a rerun of the Soviet Union’s disastrous occupation of Afghanistan in the 1980s. With perfect timing, and taking advantage of the vacuum left by Obama’s decision not to get involved in Syria, Putin had put Russia back on the geopolitical map. He made a surprise visit to Damascus in December to declare: Mission accomplished. He should have learned from former U.S. President George W. Bush never to say that – because now everything is starting to fall apart for the Russians. There was last month’s Sochi conference, where attempts to agree a political process for Syria’s future under Assad, with the usual farce of elections, failed even before the delegates arrived. Turkey has launched a large-scale incursion into northwestern Syria, in an attempt to prevent Kurdish YPG (People’s Protection Units) forces from establishing a military presence on its border. Meanwhile, the Turks are clashing with the Iranians as well, and as of Monday with regime forces too. 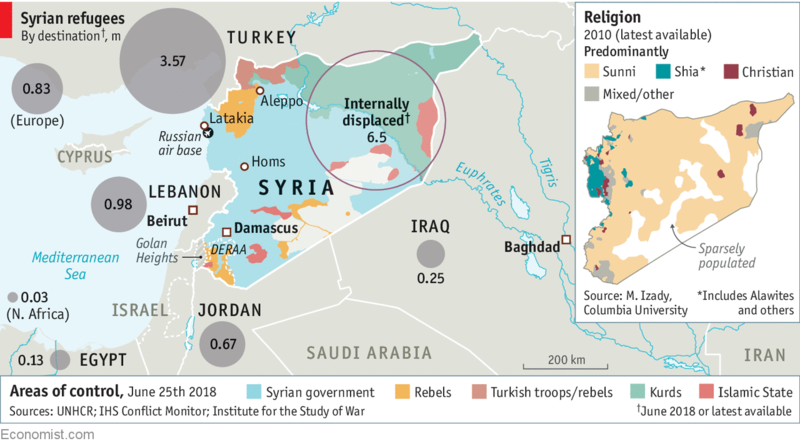 Much more worrying for Russia is that in the east of the country, another Kurdish force – the Syrian Democratic Forces, which also includes Arab, Turkmen, Assyrian and Armenian forces – is widening its control of areas once held by the Islamic State. The SDF is now the only player in Syria with U.S. military support: During a clash 10 days ago between the SDF and regime forces working together with Russian mercenaries, the United States launched a devastating airstrike. The Kremlin still won’t acknowledge any casualties, but unofficial reports from Russia claim that as many as 200 Russian mercenaries died. And then last week there was the first direct confrontation between Israel and Iran. The Turkish front is less concerning for Putin, since it doesn’t directly threaten Russia’s main interests. The clashes in the northeast are a much larger problem as they are sending coffins back home to Russia – the last thing Putin needs before the presidential election in mid-March. For now at least, the Israeli-Iranian front may not directly put Russian personnel in the line of fire. But it is a much greater threat to the Assad regime itself. Damascus is close to the Israeli border and Assad, with Iranian encouragement, is trying to assert himself by firing anti-aircraft missiles at Israel Air Force planes. For the past two and a half years, the deal between Jerusalem and Moscow was simple: Israel allowed Russia to resupply Assad’s army and help the regime – through aerial bombardments of rebel-held areas, indiscriminately killing thousands of civilians – to retake large swaths of territory. Russia, meanwhile, turned a blind eye as Israel continued its periodic attacks on convoys and depots of Iranian-supplied weapons destined for Hezbollah. Russia collaborated with Iran in reviving the regime, while not intervening when Israel struck at Iran’s proxies. When Israeli Prime Minister Benjamin Netanyahu demanded that Russia prevent Iran’s forces from building permanent bases on Syrian soil, Putin tried to strike a compromise. Iran continued entrenching its Shi’ite militias, but at the same time didn’t come too close to the Israeli border or begin building large bases. That balance can no longer hold. The decision by Iran’s Revolutionary Guards Corps (IRGC) to send a drone into Israeli airspace in the early hours of Saturday February 10, followed by Israel’s retaliation against the Iranian command unit that launched the drone and the ensuing air battle between Israeli fighter jets and Syrian air defense batteries, was proof that Russia can no longer contain the interests of all the different sides within Syria. Putin has utilized “hybrid warfare” – a combination of military power, deniable proxies and cyberattacks – to destabilize neighboring countries like Georgia and Ukraine, which tried to get too close to the West. Relatively small investments for major gain. But just like Russian interference with the U.S. presidential election, where the Kremlin wanted only to undermine America’s democratic process but never actually believed it could help get Donald Trump elected, he may have gone too deep. What was supposed to be an exercise in troublemaking is, despite Trump’s reluctance, now a full-blown confrontation with the U.S. intelligence services. Managing a multitrack Middle East policy and engaging simultaneously with all of the regional players takes time, resources and, especially, experience. Until recently, the United States had the combination of seasoned diplomats, military and intelligence officers – with extensive contacts and time spent in the region – to maintain such a complex operation. Under President Trump, many of these professionals have left the administration, and there is no clear sense of direction from the White House for those remaining. But the lack of any real U.S. presence or policy doesn’t mean someone else can just come along and take over its traditional role. It’s not just that the Kremlin doesn’t have anything resembling this kind of network. Putin’s centralized way of doing business means that every decision goes through him in Moscow. This isn’t helping Russia keep a handle on evolving events on the ground, but it is an advantage for Netanyahu – who is currently the regional player with the best personal relationship with Putin. There are currently two schools of thought within the Israeli intelligence community. The skeptics believe Putin will not give up on his Shi’ite boots on the ground and will ultimately limit Israel’s freedom to operate in the skies above Syria – pushing Israel to make a difficult choice between sitting on the sidelines while Iran and Hezbollah build up their outposts or confronting Russia as well. The optimists believe Putin knows Israel has the power to jeopardize its achievements and threaten the Assad regime, and will therefore rein in the Iranians. Netanyahu’s team has been working closely with the Russian president for years, and the two leaders speak regularly on the phone and meet every few months. When they’re on their own, with just fellow Likud lawmaker Zeev Elkin to interpret, does Netanyahu openly threaten to destabilize the Assad regime? Probably not. The implied threat is enough. Putin will have to make the call on Israel or Iran soon – or risk losing all he has invested in Syria. The Intercept learned the outlines of the safe-zone expansion plan through a monthslong investigation relying on information from a variety of sources, including Syrian opposition activists on the ground in the south, Syrian opposition figures based in Jordan, Syrian government sources, and an Israeli-American NGO directly involved in the safe-zone project. The safe zone appears intended to keep the Syrian army and its Iranian and Lebanese allies as far away from Israel’s border as possible, as well as solidify Israel’s control over the occupied Golan Heights. Israel seized the Golan from Syria in 1967’s Six-Day War. 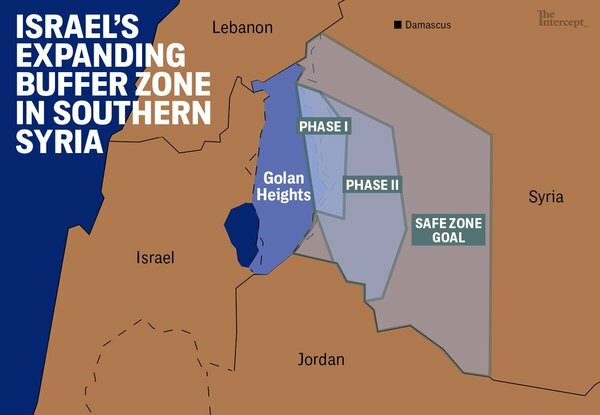 Expanding a buffer zone would likely make any negotiations over the return of the Syrian territory more difficult in the future, because the Golan Heights will be surrounded on both sides by areas with significant Israeli influence. OVER THE SUMMER, Israeli army and intelligence officials began implementing the second phase of the safe-zone project. They started to train and equip a force of around 500 Syrian opposition fighters from the Syrian rebel group, #Golan Knights, as a border police force. 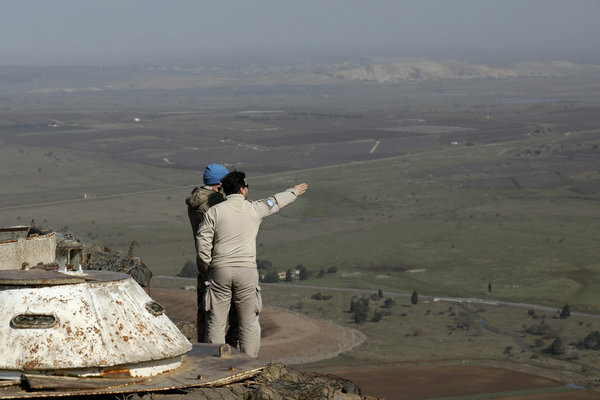 The border guards, responsible for the border between the safe zone and the Israeli-occupied Golan Heights, would monitor the area and report back to the Israelis, according to a Syrian opposition source in the area and Syrian government sources monitoring the area, neither of whom agreed to be quoted on the record because of the sensitivity of the issue. The first would be the result of a reaction by one of Israel’s enemies to an Israeli show of force. The second would stem from a flare-up on the Palestinian front. When the terrorism genie gets out of the Palestinian bottle, it takes many months or even years to put it back. The first scenario, which the army terms “the campaign between the wars,” might happen when Israel tries to prevent rivals from obtaining advance weaponry they might want to use during a future war, according to Eisenkot. Most of these operations occur under the radar, far from Israel’s borders. Usually, such operations draw little media attention and Israel invariably dodges the question of responsibility. The previous Israel Air Force commander, Gen. Amir Eshel, told Haaretz last August there were nearly 100 such attacks under his five-year command, mostly on Syrian and Hezbollah arms convoys on the northern front. It is usually accepted practice to call out intelligence officials over mistaken forecasts. But we received a small example of all these trends on various fronts over the past two weeks. The cabinet convened for a long meeting about the northern front last Sunday. Arab media reported early Tuesday morning about an Israeli attack on Syrian army weapons depots near Damascus. A base in the same area, which Iran had reportedly built for one of the Shi’ite militia groups, was bombed from the air in early December. In most of the recent attacks, the Syrians fired at the reportedly Israeli aircraft. The Syrians also claimed recently that the attacks have become more sophisticated, made in multiple waves and even included surface-to-surface missiles. A few days beforehand, there was a report about an Israeli aerial attack – apparently on a cross-border attack tunnel – next to the Gaza border. Meanwhile, in the West Bank, the demonstrations to protest U.S. President Donald Trump’s recent recognition of Jerusalem as the Israeli capital were dying down, out of a seeming lack of public interest. Then, on Tuesday evening, Rabbi Raziel Shevach, from the illegal outpost of Havat Gilad, was killed in a drive-by shooting attack near Nablus. The army responded by surrounding villages and erecting roadblocks around Nablus, for the first time in two years. The IDF moves were acts of collective punishment the chief of staff would normally rather avoid, but they were approved on a limited basis due to the murder of an Israeli. Prime Minister Benjamin Netanyahu hinted that the Shin Bet security service is close to solving the murder, but at the time of writing it was still unclear who did it. Hamas and Islamic Jihad released statements praising the deed, while, in a rare move, Fatah’s Al-Aqsa Martyrs’ Brigades – which has been virtually inactive for a decade – took responsibility for the attack. Its statement, which was posted on several Facebook pages, attributed the attack to the “Raed Karmi cell,” marking the anniversary of the Al-Aqsa Martyrs’ Brigades leader’s death. Israel assassinated Karmi – the military leader in Tul Karm responsible for the killing of many Israeli civilians and soldiers during the second intifada – on January 14, 2002. President Mahmoud Abbas is in trouble. The Trump declaration on Jerusalem provided him with a temporary escape. Last November the Palestinians received worrisome information that the Trump administration’s brewing peace plan was leaning in Israel’s favor. Trump’s so-called deal of the century would likely include leaving settlements in the West Bank in place, and declaring Abu Dis the Palestinian Jerusalem, capital of a prospective state. Abbas soon discovered that rejecting a reopening of talks with Israel didn’t stop the drumbeat of bad news coming his way. UNRWA was facing a severe financial crisis well before the Trump administration threatened to freeze the U.S. share of funding for the UN agency in charge of Palestinian refugee assistance. The crisis, incidentally, also worries Jordan, which hosts at least 3 million Palestinian refugees and descendants. The flow of funds from the donor nations to the territories is dissipating, at a time that the reconciliation process between the PA and Hamas has ground to a halt, with Abbas saying he doesn’t see any benefit that can come of it. The large number of gliders the Palestinians have launched near the border recently likely attests to intelligence gathering ahead of attacks. Israeli officials are also kept awake by recent reports from Syria of a mysterious glider attack against a Russian air force base in the country’s north. Organizations in Gaza are in arm’s reach of this technology. The civil war in Syria, which enters its eighth year in March, has not completely died out. The Assad regime, which has restored its rule over most of the country’s population, is still clashing with rebels in the Idlib enclave in northern Syria and is preparing for an eventual attack to chase the rebels out of the border area with Israel, along the Golan. The two attacks on the Russian base in Khmeimim (artillery shelling, which damaged a number of planes and helicopters, preceded the glider attack) indicate that some of the groups are determined to keep fighting Assad and his allies. The war in Syria started with a protest by residents of Daraa, a town in the south, against a backdrop of economic difficulties for farmers whose incomes were suffering from desertification. The regime’s brutal methods of oppression led to the spread of protest, and things quickly descended into civil war, in which several countries have meddled until today. The war often has consequences on nature. There has been a rise in the number of rabies cases in Israel in recent months, mainly in the north. One of the possible explanations involves the migration of rabies-infested jackals from Jordan and Syria. During the war Syria has suffered a total collapse of civilian authority, and certainly of veterinary services. When there are no regular vaccinations, neighboring countries suffer as well. Such outbreaks can erupt easily, even closer to home. The European Union is expected to hold an emergency session in Brussels about the worsening humanitarian crisis in Gaza. The Israeli defense establishment has confirmed the frequent reports by humanitarian organizations of the continued collapse of civilian infrastructure, mainly water and sanitation, in Gaza. Wastewater from Gaza, flowing straight into the sea, is reaching the beaches of Ashkelon and Ashdod. I recently asked a senior Israeli official if he doesn’t fear an outbreak of an epidemic like cholera in Gaza. “Every morning, I am surprised anew that it still hasn’t happened,” he replied. More so. His closest former associates told Al-Monitor on condition of anonymity that between the years 1993 and 1995, Rabin had developed a vision for a permanent status agreement to be achieved before the year 2000. The first essential element of the plan was sharing of the land between the Mediterranean Sea and the Jordan River, with the Palestinian state being demilitarized and the Jordan River serving as Israel’s security boundary. Security arrangements would be agreed upon, with Israeli military presence along the Jordan River. The plan also consisted of relocating dispersed settlements into “settlement blocs,” mainly in the Jerusalem area. A united Jerusalem would remain under Israel’s control, except for the East Jerusalem Palestinian neighborhoods. The plan referred also to the Palestinian refugees, granting no right of return to Israel. Instead, the plan offered right of return to the new Palestinian state and international reparations. Rabin’s plan favored international and Israeli investment in the Palestinian economy. There was also a Jordanian angle to Rabin’s plan, as he held the Jordanian kingdom in very high esteem. The plan proposed a Jordanian-Palestinian confederation that would be decided between the two parties. The last part of the plan consisted of normalizing relations between Arab countries and Israel. At the time, Rabin even favored a peace treaty with Syria and was ready to give up the Golan Heights for the proper security arrangements. Above all, Rabin believed in a strong strategic relationship with the United States, which would have made such an agreement with the Palestinians possible. He definitely had the courage to make the necessary decisions for such a deal. His peace and security legacy is today espoused by the most senior veterans of Israel’s security establishment. The material being posted on the state archives’ website includes hundreds of pages of minutes from meetings of the inner cabinet between August and December 1967. From reading them, it is clear that in the several months that followed the June 1967 war, members of the security cabinet were perplexed, confused and sometimes helpless in the face of the new challenges to the state. Israel conquered East Jerusalem, the West Bank, the Gaza Strip, the Golan Heights and the Sinai Peninsula in under a week. It was not even remotely prepared for this scenario, and had to hit the ground running. In December 1967, six months after the war, Prime Minister Levi Eshkol speculated over how to deal with the hundreds of thousands of Arabs newly under the state’s control. “At some point we will have to decide. There are 600,000 Arabs in these territories now. What will be the status of these 600,000 Arabs?” he asked. 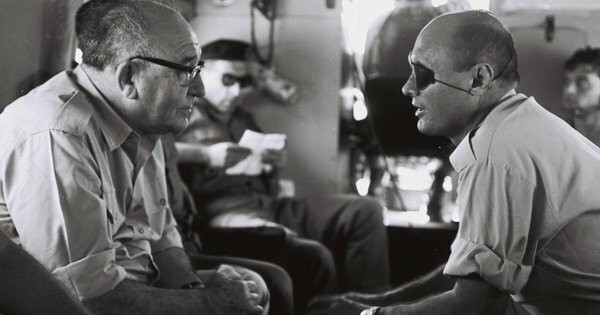 One idea raised by Defense Minister Moshe Dayan was to give the Arabs of the West Bank and Gaza permits to work abroad, in the hope that some would prefer to stay there. “By allowing these Arabs to seek and find work in foreign countries, there’s a greater chance that they’ll want to migrate to those countries later,” Dayan said. As for Gaza, Dayan was pretty optimistic. According to his calculations, of the 400,000 people who then lived in Gaza, only 100,000 would remain. The rest, whom he termed refugees, “must be removed from there under any arrangement that’s made.” Among his ideas was to resettle the Gazans in eastern Jordan. Justice Minister Yaakov Shimshon Shapira took the opposite position, calling for Israel to withdraw from the territories and warning that Israel couldn’t exist as a Jewish state if it retained them. “We won’t be able to maintain the army, when there will such a large percentage of residents who [won’t serve] in the army. 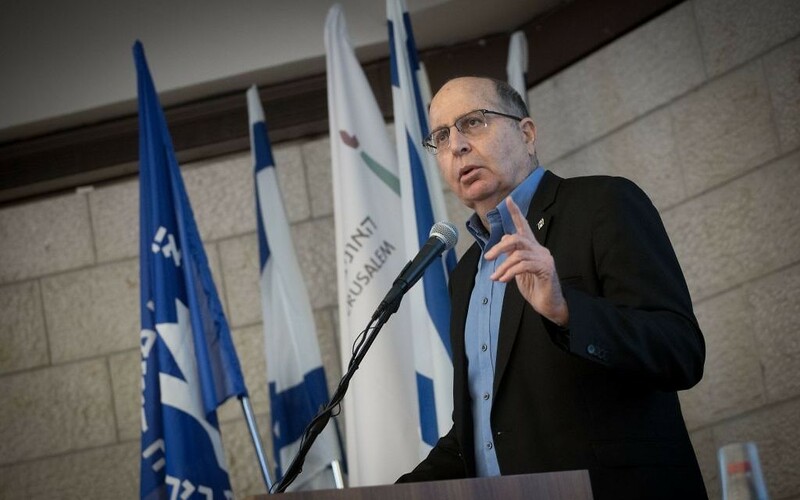 There won’t be a[n army] command without Arabs and certainly there won’t be a government or a Knesset Foreign Affairs and Defense Committee without Arabs when they’re 40 percent,” he said. Finance Minister Pinhas Sapir said that remaining in the territories would be “a disaster for the State of Israel,” which would become an Arab state. He warned that there was nothing to stop the West Bank from suddenly declaring independence, and that it was only a matter of time. Aranne objected to the argument, put forth by Dayan and others, that Israel must retain the territories for security reasons. “Suddenly, after all these victories, there’s no survival without these territories? Without all those things we never dreamed of before the six days of this war, like Jerusalem?” he asked. Arab rights didn’t seem to be much of a concern for Aranne; he was more worried about the future of the Jewish state. “The way I know the Jewish people in Israel and the Diaspora, after all the heroism, miracles and wonders, a Jewish state in which there are 40 percent Arabs, is not a Jewish state. It is a fifth column that will destroy the Jewish state. It will be the kiss of death after a generation or a generation and a half,” he warned. “I see the two million Jews before me differently when there will be 1.3 million Arabs — 1.3 million Arabs, with their high birth rate and their permanent pent-up hatred. ... We can overcome 60,000 Arabs, but not 600,000 and not a million,” Aranne concluded. Within the inconclusive discussions of the future of the territories are the seeds of talk of establishing settlements, outposts and army bases. The minutes show that even half a year after the war, the government had not formulated an orderly policy on this issue, but discussed various ideas even as it chose to delay making these tough decisions as well. Allon was all for it. “There is a benefit in finding the first nucleus of people willing to settle there. The desire of these yeshiva students is a great thing. There aren’t always candidates willing to go to such a difficult place.” No decision on the matter was made at that time, however. There were also cabinet members who spoke of preparing for the next war. The minutes included pessimistic reports about the number of warplanes left to Israel after the war. It was argued that the Arab states had already acquired new planes and had more than Israel. Belgium was mentioned as a possibility: It was claimed that Brussels had offered to help Jerusalem circumvent the French embargo by procuring French planes and even German tanks for Israel. Dayan warned, “The impression, as of now, is that not only are the Arabs not rushing to make peace, they are slowly starting to think again about war.” It was six years before the Yom Kippur War. #Nasrallah's speech on 10-Nov, on the ’day of the martyr’. Note: I don’t translate religious terminology. Since last Saturday, Lebanon was entered into a political crisis and a new and important situation. Whether or not the situation is dangerous depends on the Lebanese ability. We hear threats. What is the situation? In one year, Lebanon entered a political stability - with a President, a Prime Minister, and a national-unity government. A budget was decreed, for the first time in 12 years. A voting law was passed for elections. Dialogue and conversations amongst political spectrum after years of isolation. Security and stability in Lebanon that has no comparison. (We are safer than the US.) We have a calmness among Lebanese, in general. This does not mean that there are no problems. Even official polls show this, such as within the Beirut airport the number of travelers in the airport is 9 million. 2 million in just July and August. This is a reflection of security and calm. This does not mean that there are no problems. there are livelihood problems and corruption and political. These should be resolved, yes, but shoudl not cover the positive side of Lebanon in general. All are responsible for this security. The compromises made by everyone brought us to this stage of security. And the liberation of Lebanon in Arsal and others also brought us here. So what have the Saudis done until now? (1) Direct and exceptional intervention to force the PM to resign and to read a letter that they (Saudi) had read, to place the PM under involuntary detention and not allowed to return. It is clear today that all Lebanese know that the PM was forced to resign, and all the world knows, even the US Foreign Office claim they had no knowledge. The PM is held captive in Saudi and is not allowed, until now, to return to Lebanon. (2) A Saudi attempt to remove Hariri from his leadership of the Future movement, and to impose a new leadership upon the Future movement. (3) A Saudi attempt to impose a new PM on Lebanon - under threat and with their vision. (4) Attempts to inflame Lebanese against each other, to drive Lebanese to insult and protest against each other, and to fight each other. ANd when Saudi Arabia doesn’t find a response, then it accuses Lebanese of cowardice. (7) More dangerous - although it does not scare us - encouraging Israel to attack Lebanon. This is not analysis, but clear facts and information. Saudi has asked Israel to attack Lebanon and is ready to support it with millions of dollars! Today there is a discussion within the Zionist entity on this issue, and today and yesterday within the Israeli press, there is lots of discussion that the 2006 was upon a Saudi request and that Saudi encouraged Israel to continue with the war until the Resistance was vanquished. Of course, Israel has its own calculations. Clearly, Saudi leadership has declared war on Lebanon, and not just on Hezbollah in Lebanon. Clearly, they have declared war on all of Lebanon. I say to all Lebanese, with all love and honesty, to propose to them ... Until the evening of the resignation, we were living a very important stage - of stability and security; we need to realize that this was/is very important. We need to understand the importance and value that we are living in Lebanon and to protect it. On the other hand, Saudi calls upon you to destroy it the stability and security in Lebanon, to destroy your own homes with your own hands. Will you do that? Is it true that Saudi, through all these actions, want to save Lebanon? We understand that there is a problem between Saudi and Hezbollah, but are these actions by Saudi a war against Hezbollah or a war against Lebanon? Lebanese need to learn from all that has happened around them in the region. In Syria, the facts - from documents and interviews and clear statements - leaders from Saudi were on the battlefield and what happened? Those Saudi who were running the battlefield from Amman, where are they now? I call on Lebanese to think very carefully before taking a position: to where are we taking the country? Lebanese today are facing a critical path..
(1) In clear language, we condemn this Saudi intervention in Lebanese internal politics. We condemn this insulting behavior against PM Hariri, from the time he arrived at the airport ... The facts are clear. We consider, in Hezbollah, that an insult against Lebanon’s PM is an insult against every Lebanese. He is Lebanon’s PM! (2) We join our voices with all Lebanese in calling for the return of Saad Hariri to Lebanon! Let him resign from the Presidential Palace, and say and do what he wishes. He may come and declare war on Hezbollah - but let him come, let him return to Lebanon, and declare his own thoughts. But for Lebanon’s PM to remain in involuntary detention is not acceptable. NO Lebanese or Arab or free person should accept this. Yes, we say, in all clarity, Lebanon’s PM is held hostage in Saudi! and we call for his release. (3) Currently, we consider the declared resignation to be unconstitutional, and illegal, and illegitimate, and of no value - because it was not voluntary. No value to any statement made involuntarily! This applies to individuals, of course it applies to the fate of nations. The current government is still viable and legitimate and constitutional. If Hariri returns to Lebanon and submits his resignation, even if under pressure but if he offered it here in Lebanon, then we would be under a different legal and constitutional situation. As I stated on Sunday, do not worry and do not fear. Our collective desire to keep our country safe is the insurance. Today, in the face of this insult and the clear and declared threats, we need to feel responsibility to our nation and to each other, and to stand together and protect each other and defend each other, and to overcome our fears and sensitives of each others. (6) I need to pause, as I did Sunday, in the face of the Arabiyah’s words about an assassination attempt against Hariri. Different security agencies in Lebanon refuted this - yet Arabiya Channel continues with this claim. This is Saudi news. Also the letter read by Hariri is Saudi statement. Their claim that certain Iranian elements worked for and spoke of an assassination attempt. These words and insistence are dangerous; why this insistence on this accusation? What are they planning? (7) W/ regards to Israel, we have to be careful and pay attention. If Saudi calls for a war, no one can refute this possibility. We can say, that it is unlikely, based on our readings . furthermore, Israel has an opportunity now to attack Lebanon and Hezbollah without calling for a war since a war has high costs for Israel. .. yes, Israel can join under other headlines. Israeli FM declared to all Israeli embassies to support - diplomatically and media wise - Saudi in its war against Hezbollah! Of course, Israel will work internationally shoulder to shoulder with Saudi. Also, Israel will work to create internal division in Lebanon. A week ago, there was a dangerous event in southern Syria. The armed elements, some of whom were in Nusra Front, entered - via Israeli assistance and from areas occupied by Israel - to a Syrian village (Haddath), that is predominately Druze. Were it not for the popular defense and the Syrian Army and the pressure from occupied Golan Heights - the situation would have become much worse. For who? For Nusra Front? For what - for sectarian division between Sunni and Druze in the region? ... As for a war, we are following the situation carefully, along w/ the Lebanese Army. .. ON this day, of Ahmad Qasser who imposed a 3 day mourning on them in 1982, I say to them - that today we are stronger! Let them not think that we are scared; not at all! We are stronger! ... Israel will not lead a war for others, as their press declares will Saudi fight until the last Israeli soldier? ; Israel will have a war based on their own calculations. (8) What is between us and Saudi? Let no one claim that we are hiding from the problem. Yes, we do not deny that there is a problem. There is large Saudi anger directed against us, though primarily against Iran. I understand their anger, but we cannot understand their reaction and their insult! In Syria they had plans and hopes to change the region’s borders and maps; their hopes are vanquished. ISIS that they created is being vanquished. In Iraq, we know who brought ISIS also. We also know that they were supporting the separation of Iraqi Kurdistan and this plan also failed. In Yemen, the war has gone on for more than 1000 days! Only more massacres and now a blockade! The UN declares that if the blockade continues, then millions in Yemen would face famine! This is the current situation by Saudi. The UN - not Hezbollah - placed Saudi on the blacklist for their killing of children. But when we condemn their actions we are accused of committing a historical crime. We cannot be quiet if others are quiet. They commit these massacres but they get infuriated if their massacres are condemned. Yesterday you heard [the claim] that the missile - from Yemen to the airport in Riyadh - was smuggled from Iran, and Hezbollah was the one who sent the missile from Yemen! There is a problem with this logic. In the Saudi leadership mind they underestimate and insult Yemenis. They cannot believe that Yemenis can build missiles. Yes, Yemenis within these years can build their own missiles! Yemenis build their own drones. It is because the Saudis insult the mind of the Yemenis and underestimate them, that is when they lose. And so the Saudi blame Iran and Hezbollah for their failure in Yemen. This is the Yemeni people! They have fought and sacrificed and surprised the world. the claim that the Saudi plan in Yemen is a failure because of Hezbollah .. then wow, we are something great really! This is an exaggeration. ... What about the failure between Saudi Arabia and Qatar? We have not taken a position on this issue. Saudi wanted Qatar to kneel, and it didn’t. Also a failure. And Bahrain, yes, Saudi prohibited public protests, and threw thousands in the jails, and yet this didn’t break the will of the people but pushed the monarch to near bankruptcy! The Bahraini king regularly gets money from Saudi to pay the salaries in the Army. This is what Saudi has done to Bahrain. Another failure. Let me simplify things to you. Saudi is coming to vent its anger at us in Lebanon. It cannot respond to Iran. To Saudi: if you think that you can defeat Lebanon or to defeat the Lebanese resistance or to defeat the Lebanese political leadership, then you are wrong and you have nothing but failure as you have failed elsewhere. More detail... If you think your objective can be the obliteration of Hezbollah, no matter what Saudi does, they cannot defeat Hezbollah. Don’t let that be your objective. Let your objective be realistic. Punish Hezbollah or pressure Hezbollah so it can change its actions. To leave Syria? Well, the battle is ending in Syria. Okay, pressuring and sanctioning Hezbollah to change its actions... Our position with Yemen will not be changed, because it is right! God will ask us about our position and our position there is outside of any political calculations. As Saudi Jubair said yesterday, the Lebanese people are innocent and they are under the control of Hezbollah and we need to find a way to help Lebanese to get out of Hezbollah’s control. Great. Is this a way to rescue the Lebanese people? Are your actions in line with that objective? OR do you want to rescue Lebanese as you are trying to rescue the Yemeni people, since isn’t the war on Yemen also under the headline of rescuing the Yemeni people? Millions threatened with famine! Not one place has been left unbombed, the souks, the mosques... Is this how you rescue the Yemeni people? by killing and besieging them?! that is your way. this is how you want to rescue the Lebanese people? Want to rescue the Lebanese people by insulting Lebanon’s PM?! Rescue Lebanese by fear-mongering? Is Lebanon to be punished because we did not obey Saudi dictates? Even the declaration by the Future Movement calling the return of Hariri was criticized! It is not allowed to even breath. On this day, on this great day of great martyrdom, we are here, together, holding on to our achievements, to our country and our army, to our national unity. We should not worry or be scared from all these threats. Les ennuis continuent pour Teresa May qui pourrait perdre un nouveau membre de son gouvernement. Priti Pattel, la secrétaire d’Etat britannique au Développement international pourrait démissionner. En cause : des rencontres secrètes avec des dirigeants israéliens. 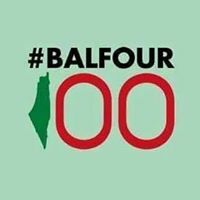 Objectif recherché selon elle : financer l’assistance humanitaire apportée à des blessés syriens dans le Golan. Dans son mea culpa, elle aurait omis de dire que cette aide impliquerait de financer l’armée israélienne, dont Londres ne reconnaît pas l’occupation partielle par Israël. Si la Première ministre l’a simplement réprimandée, la presse britannique, elle réclame sa tête. Another window on Israel’s meddling opened briefly last week. The BBC’s political editor, Laura Kuenssberg, took to Twitter to relay a damning comment from an unnamed “senior” member of Ms Patel’s party. In a clear reference to Israel, the source observed: “The entire apparatus has turned a blind eye to a corrupt relationship that allows a country to buy access”. A short time later, presumably under pressure, Ms Kuenssberg deleted the tweet. The BBC has not reported the comment elsewhere and the senior Conservative has not dared go public. Such, it seems, is the intimidating and corrupting influence of the lobby. That is under threat, however. Social media and Palestinians with camera phones have exposed a global audience to systematic abuses by the Israeli army the western media largely ignored. For the first time, Israel supporters sound evasive and dissembling. Meanwhile, Israeli prime minister Benjamin Netanyahu’s strident efforts in the US Congress through 2014 and 2015 to prevent a nuclear accord with Iran dragged the lobby even farther out of the shadows. It is noteworthy that Ms Patel’s downfall came about because of social media. Israeli officials like police minister Gilad Erdan were so unused to scrutiny or accountability themselves that they happily tweeted photos with Ms Patel. 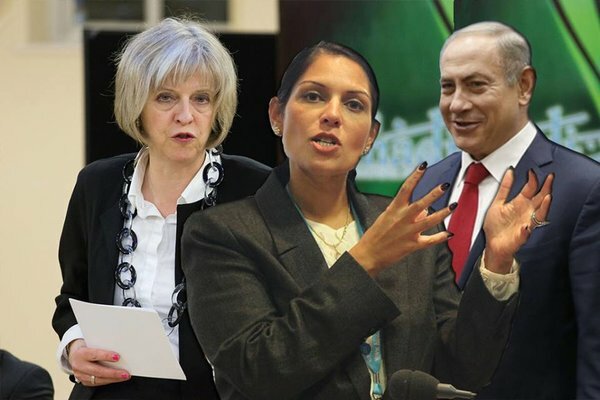 Mr Erdan is a key player in the lobby, running a “smear unit” to target overseas critics of Israel. No such Iranian presence has been identified over the past few months, but Israeli intelligence expects the Iranians to infiltrate the border area gradually, and that over the long term the Iranians intend on building a military and intelligence presence along the border with Israel. 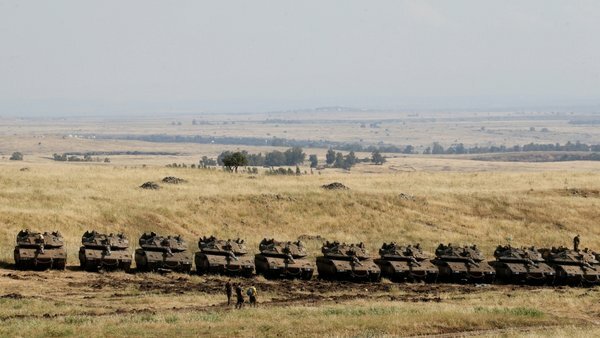 The Iranians intend on using the Syrian Golan Heights as a secondary front against Israel in the case of another war breaking out between Israel and #Hezbollah, experts say. The weapons manufacturing plant that occurred early Thursday morning in western Syria is a site clearly identified with the regime of Syrian President Bashar Assad. The exceptional attack, which foreign media are attributing to the Israel Air Force, appears to be a message to the world powers that maintain a prominent aerial presence in the area. Over the past two years, Russia has invested huge efforts in saving and rehabilitating the Syrian president. The bombing is not routine, either in its target or its timing. In an interview with Haaretz last month, outgoing air force chief Amir Eshel said that over the past five years, the air force had launched attacks on the northern military theater and on other fronts. But most of these forays were designed to quell efforts to strengthen Hezbollah and other terrorist and guerrilla groups. This time, according to Syrian reports, the target was a government one – a missile production facility run by the Assad regime – rather than another Hezbollah weapons convoy destined for Lebanon. Over the past year, senior Israelis have highlighted their concerns following the wide steps taken by the Iranians to try and enlarge and upgrade the supply of precision missiles in Hezbollah’s possession. Prime Minister Benjamin Netanyahu, Defense Minister Avigdor Lieberman, Israel Defense Forces Chief of Staff Lt. Gen. Gadi Eisenkot and Military Intelligence chief Maj. Gen. Herzl Halevi have all made reference to this in public appearances. For several years now, Hezbollah has maintained a huge weapons arsenal, containing between 100,000 and 130,000 missiles and rockets (according to various estimates). If the proportion of precision missiles is increased and their precision improved, that could enable the organization to inflict more devastating damage to the Israeli home front in a war. In accordance with its declared policy, Israel is acting to prevent Hezbollah improving the quality of its weapons. The chaos the Syrian civil war has caused, during which serious damage has been inflicted on the capabilities of Assad’s army, has seemingly made this easier for Israel. Syria has for years been a no-man’s-land that no one has controlled. That changed with the arrival of the Russians two years ago. According to foreign media, the deployment of Russian squadrons in northwest Syria since September 2015 hasn’t entirely halted the Israeli attacks. But the strategic reality has become more complicated. The prime Russian interest is the survival of the Assad regime. For Moscow, it is important to show that the regime is stable and that Russia is the party dictating what takes place in Syria. The attack on the facility – the Syrian Scientific Researchers Center – undermines that image, and could concern the Russians. The timing of the action attributed to Israel is sensitive. At the end of July, in a Russia-led effort, the Assad regime reached a partial cease-fire with Syrian rebel groups. Although the fighting has continued in various regions, its intensity has declined in many places. The United States, whose interest in Syria has been on the decline, acceded to the Russian initiative. Washington and Moscow also failed to heed Israeli protests that the agreement to reduce friction in southern Syria failed to require Iran and allied militias to steer clear of the Golan Heights. Consequently, the attack attributed to Israel – the first to be reported since the agreement was reached – may be interpreted as an Israeli signal of sorts to the world powers: You still need to take our security interests into account; we’re capable of disrupting the process of a future settlement in Syria if you insist on leaving us out of the picture. Since the attacks attributed to Israel began in January 2012, the Assad regime has shown restraint in the vast majority of cases, other than in one incident in March this year when missiles were fired at Israeli planes after an attack near the town of Palmyra in eastern Syria. One missile was intercepted by an Arrow missile over Israel. At first, the Syrian regime totally ignored most of the attacks. At later stages, it would accuse Israel and sometimes even threaten a response, but it didn’t follow through. The reason is clear: The damage sustained by the regime from the responses was marginal compared to the harm to civilians in the civil war, and the last thing President Bashar Assad wanted was to drag Israel into the war and tip the balance in the rebels’ favor. Israel will have to see how recent developments are received in Moscow, Washington and Tehran. The response won’t necessarily come immediately. Russia is not hostile to Israel but, above all, it looks after itself and Assad. The Russians will also take the consequences on countries in other areas into account, as well as its tangled relations with the United States – which has been acting as a present-absent party in the Middle East for a long time now. This comes against the backdrop, beginning Tuesday this week, of a large Israeli military exercise based on a war scenario with Hezbollah. In fact, Israel is taking pains to declare that the exercise was planned nearly a year in advance and that it has no warlike intentions. But the fact that the exercise was carried out has raised the anxiety threshold among Hezbollah’s leaders. Al-Manar, the Hezbollah television station, declared Wednesday that Hezbollah isn’t worried about a war. That’s very inaccurate. To a great extent, Hezbollah, like Israel, is worried about a war and would prefer to avoid one – but in the Middle East things sometimes happen when you don’t exactly intend them. The early morning attack came exactly 10 years and a day after the bombing of the North Korean nuclear facility in eastern Syria, which U.S. President George W. Bush and others attributed to Israel. Last time (and then too, by the way, an attack came during a major exercise by the air force) a war was averted. That’s the hope this time too. A la lumière de la confirmation avec les effets psychologiques et politiques à mesure de la victoire syrienne de Deir ez-Zour, le long commentaire ci-dessous d’Alastair Crooke sur la “panique Netanyahou” prend une singulière importance. Les Syriens d’Assad ont, avec l’aide des Iraniens et surtout du Hezbollah, et le soutien aérien massif de la Russie, emporté une victoire stratégique qui marque évidemment un tournant dans le conflit syrien, et sans doute un tournant décisif. Le concours du Hezbollah dans cette bataille, comme dans la majeure partie du conflit, constitue un élément majeur de ce conflit, et l’une des préoccupations fondamentales de Netanyahou. Une attaque aérienne israélienne la nuit dernière, contre une position syrienne proche de la frontière libanaise avec des missiles air-sol tirés d’avions israéliens ayant pénétré prudemment l’espace aérien libanais (et pas syrien), signale cette extrême nervosité israélienne, mais sans convaincre de l’efficacité de la chose. Les Israéliens ne sont pas en position de force. Selon plusieurs sources, les Russes tiennent complètement l’espace aérien de la région, notamment avec l’arrivée de cinq avions d’alerte et de contrôle de l’espace aérien à très grandes capacités Beriev A-50 désormais basés en Syrie. D’autre part, DEBKAFiles signale que le Hezbollah devrait être conduit à changer complètement ses tactiques et sa stratégie suite aux victoires remportées en Syrie, ce qui rend complètement caduc le scénario utilisé par les forces armées israéliennes dans des manœuvres en cours pour ttester ses capacités de l’emporter sur le Hezbollah : « In the remaining seven days of the exercise, the IDF still has a chance to update its scenario », écrit ironiquement DEBKAFiles. The increasingly “not to be” constituency of the Middle East has a simpler word for Netanyahu’s “#ethnic_nationalism.” They call it simply #Western_colonialism. Round one of Chas Freeman’s making the Middle East “be with Israel” consisted of the shock-and-awe assault on Iraq. Iraq is now allied with Iran, and the Hashad militia (PMU) are becoming a widely mobilized fighting force. The second stage was 2006. Today, Hizbullah is a regional force, and not a just Lebanese one. @simplicissimus : Pour aller dans ton sens, le timing israélien est intéressant, juste après le désencerclement de Deir-Ezzor, commepour dire on est là. Et il vient appuyer, si l’on peut dire, le rapport de l’ONU accusant - same player shoots again - la Syrie d’attaque chimique. “Just to be clear: if 2006 marked a key point of inflection, Syria’s “standing its ground” represents a historic turning of much greater magnitude. It should be understood that Saudi Arabia’s (and Britain’s and America’s) tool of fired-up, radical Sunnism has been routed. And with it, the Gulf States, but particularly Saudi Arabia are damaged. The latter has relied on the force of Wahabbism since the first foundation of the kingdom: but Wahabbism in Lebanon, Syria and Iraq has been roundly defeated and discredited (even for most Sunni Muslims). It may well be defeated in Yemen too. This defeat will change the face of Sunni Islam. The Syrian Scientific Studies and Research Center is the code name for part of the Syrian unconventional weapons industry. The center, better known by its French acronym CERS, is commanded by a Syrian general. It is also responsible for Syria’s chemical weapons manufacturing plants, which are reportedly located in three separate sites: Two near Damascus and the third close to the city of Masyaf, northwest Syria, only about 70 kilometers (43 miles) from the Khmeimim Russian Air Force base near Latakia. According to official Syrian reports, Israeli planes attacked CERS from within Lebanese territory early Thursday morning. The reports do not provide details of the damage to the facility and what it made. But an official statement said the attack was meant to raise the morale of Islamic State fighters after they suffered serious casualties in the fighting around Deir ez-Zor. According to President Bashar Assad’s regime in Syria, Israel not only founded ISIS, it also aided in its recent operations. It is not completely clear whether this facility, where they manufacture long-range missiles and artillery shells, also continues to assemble chemical weapons shells. But if Israel knows about such production at the plant, then there is no doubt the United States and Russia know about it too. We can assume Israel informed Washington before the attack and received the necessary nod of approval. As far as Russia is concerned, meanwhile, it seems Israel decided to attack from within Lebanese territory to avoid the need to coordinate its operation with the Russians – as is required from the understandings between the two air forces whenever Israel sends fighter jets into Syrian territory – and to prevent the information from leaking out. This was not the first alleged Israeli aerial attack in Syrian territory, of course. But the timing is quite interesting. It comes after Russia threatened to veto any UN Security Council resolution that describes Hezbollah as a terrorist organization, and a short time after Prime Minister Benjamin Netanyahu met with Russian President Vladimir Putin in Sochi – a meeting Netanyahu returned from without any Russian commitment to bring about an Iranian pullback from Syrian lands. As Russian Foreign Minister Sergey Lavrov has said, Russia has made a commitment that Israel’s security interests will not be harmed as a result of the establishment of de-escalation zones in Syria. But the Russian interpretation of the meaning of harming Israel’s security interests is not necessarily the same as Israel’s definition. Given that the presence of Hezbollah forces in Syria is seen as a threat to Israel, how much more so is the presence of pro-Iranian forces deployed near Israel’s eastern border on the Golan Heights, as well as in the area near Daraa in southern Syria? At the same time, Russia – which itself does not define Hezbollah as a terrorist organization – would find it difficult to force the group’s forces out of Lebanon. That’s mainly because of Iran’s position that sees Hezbollah as an essential foundation for preserving its influence in Lebanon and as an important tactical force in the Syrian war. Unlike in Lebanon, where Iran needs Hezbollah to force the hand of the Lebanese government when necessary, Iran’s influence on the Assad regime is direct and in no need of intermediaries. Russia, which has acted to limit Iran’s freedom of operation in Syria, recognizes that it must coordinate its actions with Iran if it wishes to fulfill its aspirations to stabilize Assad’s rule. Russia has already learned its lessons from Aleppo, when it thought it could implement the cease-fire agreement that was reached at the end of last year without coordinating with Iran – and then realized that the Shi’ite militias and Hezbollah were preventing rebel soldiers from boarding the buses that were meant to take them out of the city, on Iran’s orders. The Iranian explanation was that because Tehran was not a partner to the agreement, it was not obligated by it. Russia has avoided Syrian negotiations since then, whether local or international, without Iranian participation. The attack on the weapons facility, especially one suspected of producing chemical weapons, is seemingly an act that should not cause an aggressive Russian response. Four years ago, Russia convinced then-President Barack Obama at the last minute not to attack Syria for its use of chemical weapons in Aleppo, and in return co-signed a tripartite agreement in which Syria agreed to destroy or send to Russia its entire chemical weapons inventory. Now, Russia may attempt to prove that the facility did not produce such weapons, but it is doubtful it will strain itself too much in doing so. By the way, that 2013 agreement included chlorine gas too, which the Syrian army still continues to use. Russia also understands that Israel’s alleged attack on the suspected chemical weapons plant, similar to the U.S. cruise missile strikes on Syria after the chemical weapons attack in Khan Sheikhun in April, is considered to be a legitimate action by the international community. Even Russia made it clear back in 2013 that it would not object to an attack on chemical weapons stores if the UN decided on such a step, and if it is proved Syria did use such weapons. The new element in the latest attack – if Israel did indeed carry out such an attack – is that Israel now defines what it sees as a threat in a much broader sense. The question is whether Russia will accept this definition as part of Israel’s strategic worldview – which sees Syria as a threatening enemy state. Russian agreement to expanding that definition could grant Israel approval for other attacks – such as against Syrian Air Force bases, or even against Syrian ground forces, with the argument that they are considered a threat. And so, if until now there was a red line between the Russian and Israeli air forces, this time the attack could lead at the very least to Russia imposing stricter “aerial discipline” on Israel. If this happens, Russia could declare that any foreign planes entering Syrian airspace would be considered a legitimate target for the Russian Air Force, except for coalition planes fighting against the Islamic State. From Washington’s perspective, Israel has pulled its chestnuts out of the fire. Following numerous reports on the renewed use of chlorine gas by the Syrian army, the Americans would have been forced to act. And this could have caused its relations with Russia to deteriorate even further. But the “service” Israel has provided to Washington just sinks it even deeper into the Syrian arena. This time, not only as an interested observer knocking on the doors of the superpowers in order to promote its own security interests, but as an active partner whose military presence adds yet another component to the array of forces (which already includes Russia, Iran, Turkey and Syria). But the Israeli element could threaten to spoil Russia’s plans. For example, Iran, Turkey and Russia are about to establish a security zone in the Idlib province, where most of the militia forces of the Al-Shams Front (formerly Nusra Front), which is affiliated with Al-Qaida, are concentrated. This is a region where Iran and Turkey have opposing interests, even though both are interested in a cease-fire. Turkey wants to use this region as a strategic base for military operations against the Syrian Kurdish regions that border Turkey. Iran sees Idlib province as a strategic outpost to serve as a base for its control of Syria. All three countries are planning a combined attack against the rebel centers, if Russia is unable to enforce a cease-fire according to the model that was built in the southern provinces. It would seem Israel has no real interest in the Idlib province, except for the concern about Iran’s expansion and settling in there. But the takeover of Idlib – like the military campaign in Deir ez-Zor in southeastern Syria, where ISIS continues to rack up losses – is preparing the diplomatic channels for a permanent agreement. Russia is striving to demonstrate control of Idlib and Deir ez-Zor by the end of next week, when the representatives of the various parties in the Syrian civil war are set to meet in the Kazakh capital of Astana. The Russians want to present such a takeover as proof of a total victory by the Syrian regime, a victory that would destroy the opposition groups’ tools for applying pressure. Syrian-Russian control of these two provinces would strengthen the diplomatic working assumption that Assad will continue to be Syrian president, especially since opponents of his regime in Europe, the United States and Turkey – and even Saudi Arabia – have nearly completely withdrawn their demands to remove him as a precondition to any negotiations. Such a result would obligate Israel to be a partner, even if only indirectly, in the process of establishing a new Syrian government; in the debate over the status of Iran and Hezbollah in Syria; and the guarantees that Russia, and not the United States, can provide in response to the possible threats resulting from such an agreement. Israel may very well conclude that the greater its military involvement in Syria, whether through sporadic attacks or by tightening its military ties to rebel groups, it more it will strengthen its position when the time comes to formulate a political settlement. But such a view can be a double-edged sword. It will grant Iran a wonderful excuse to increase its military presence in Syria; Russia may reduce or even eliminate its aerial coordination with Israel and declare Syrian airspace a no-fly zone; and Hezbollah could turn the Golan Heights into a legitimate front against Israel as part of its balance of deterrence with it. There is a big difference between the ability to attack specific targets and a permanent situation of two hostile fronts, one facing Syria and the second Lebanon – especially when Israel’s most important backer, the United States, is sunk deep inside itself and does not want to intervene at all.